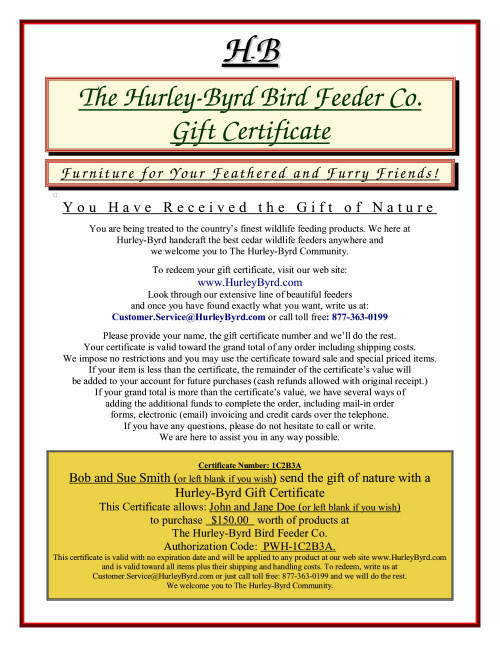 Wildlife Feeding Gift Certificate: When you send bird feeders you send two gifts: the feeders themselves, and the moment they arrive. There's the knock at the door or the package on the porch. And the next thing that happens is your special someone's heart races with delight as they open a gift they will remember for years to come. Feeder Delivery: At Hurley-Byrd, we do it differently and oversee every part of the process: from the buying of raw materials, to handcrafting the feeder, to the day your purchase arrives at the front door. We send freshly crafted feeders direct and bypass all the middlemen, which means better feeders and a better value. (Don't just take our word for it. Thousands of customers rate Hurley-Byrd "best value.") We believe in complete satisfaction and lasting value, too, which is why we guarantee a perfect feeder for you or your recipient , and also that your feeders will outlast all others available and will be enjoyed from the moment they arrive and for years to come. It's how Hurley-Byrd is changing how America feeds their wildlife. to near perfection with a beautiful penetrating oil finish so they last for years. We take pride in every step of our service, too. From the moment you first interact with us, whether on our website or on the phone, to the delivery of your feeders and gifts and everything in between. We want to make owning and gift giving easy for you. So whether it's a simple thank you, a unique deer feeder or a whole feeding station for yourself, choose Hurley-Byrd and see what a difference our feeders really make. Give a Hurley-Byrd Gift Certificate. your recipient knows you are giving them the very best. our contact information including the toll free telephone number. Once purchased, the certificate(s) will be completed with an authorization code and activated. Hurley-Byrd will not be held liable for the misuse of our gift certificates. Lost and stolen certificates can be easily replaced only if they have not been used and are still activated. A Hurley-Byrd Gift Certificate has no expiration date and refunds will only be directed to the original purchaser. Upon activation, the certificate(s) will be emailed to the email address you use at checkout unless a different email address is provided in the notes area of the checkout process. Your certificate or certificates will be activated and emailed as a Word Document within four (4) business hours of our receipt of payment. You can then email this to your recipient or print and add to your own gift card. Direct US Postal mailing from us to your recipient(s) is available at a small additional charge. Please keep in mind, the purchasing of Gift Certificates will not merge with our regular shopping cart. Due to their specific nature which requires no shipping/handling charges and a need for the fastest processing possible, they are handled as separate purchases from our regular products. Add a Real Greeting Card. Yes, REAL Greeting Cards. Call us to make this combined purchase. Click the Gift Certificate above to see a larger version. Sorry..... We no longer offer Gift Certificates.